It’s Jason Voorhees vs. Boba Fett! Not really. But kind of. 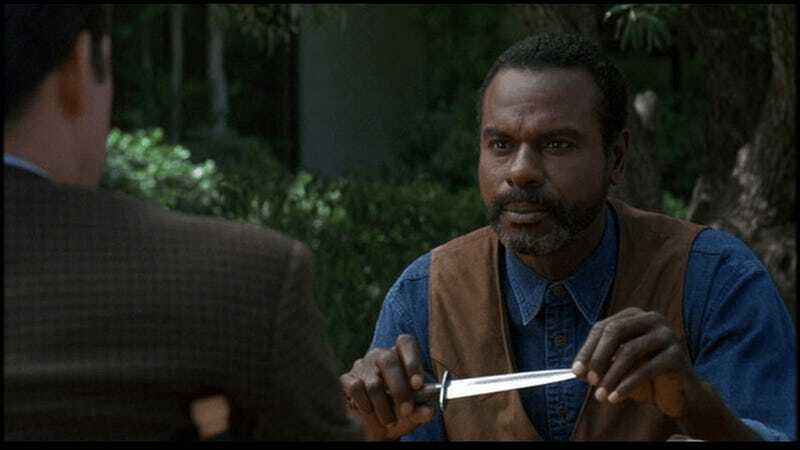 Friday the 13th fans may remember the character Creighton Duke, played by Steven Williams, from 1993's Jason Goes to Hell: The Final Friday. He was a bounty hunter and an expert in Voorhees lore who chased after Jason with a plan to kill him for good. Of course, that didn’t quite work out, and Creighton’s name was added to the Friday series’ massive casualty list. I have a movie… you’re the first ones I’ve talked about this to… that is a completely Creighton Duke-inspired movie. We’re doing that next year. I can tell you that I’m talking with Steven Williams about this. I’m dead serious about this movie. It’s something I’ve wanted to do for years. For me, that was the character that I gave a crap about. That’s the guy that I adore. And, I’m tellin’ ya, I have something up my sleeve that’s gonna knock people out. Creighton Duke movie coming! Maybe. We know what you’re thinking — the ongoing Friday lawsuit — and we’ll get to that. But first, let’s just appreciate the fantastic idea for what it is. Jason Voorhees is almost always up against people who know nothing about him, at least at first. Throughout the franchise, characters have become acquainted with Jason and learned more about him, but he rarely encounters anyone who already knows all about him right from the start. That idea alone makes for a formidable, interesting foe. Plus Duke is a beast and an anti-hero — and the dynamic between him and any villain would feel rich and fun. The big issue, of course, is that the whole Friday the 13th franchise is in the midst of a huge legal battle over the rights, to the extent that all new movies have been put on hold and even the popular video game has recently had to stop making content while it all gets settled. If Marcus is really going to make this movie next year, it probably wouldn’t have anything to do with Jason Voorhees. He might not even be able to use the name “Creighton Duke.” So it feels like there’s quite an uphill battle ahead.